FLIR lets us see the world in a better light through their thermal imaging devices. Whether you are an outdoor enthusiast, hunter, or you want something fun to do over the weekend, one of their Scout Thermal cameras is a perfect choice. The FLIR Scout Series consists of some of the best outdoor thermal cameras. These devices are all lightweight and built to withstand use in outdoor environments. The newest entry in this line is the FLIR Scout TK. It is a handheld thermal camera that is perfect for spotting or tracking animals. The Scout TK’s sub $600 price point is very attractive as well for buyers on a budget or those looking for their first thermal monocular. The FLIR Scout TK is easy to use and is small enough to fit into almost any pocket for easy transport. It gives you a crisp view of wildlife, hikers, and other things you may encounter on the trail no matter how dark it may be. The FLIR Scout TK uses thermal imaging technology which consists of advanced sensors (microbolometers) to detect heat differences of objects/animals surfaces and create an image based off this information. Unlike night vision which requires at least some ambient light; thermal imagers such as the Scout TK can work in complete darkness. This is a handheld thermal camera/monocular. The FLIR Scout uses a 160x120 VOx Microbolometer. This is an uncooled thermal sensor which contributes to the lightweight properties of this device. The FLIR Scout TK does not have the highest resolution but for an entry level thermal imaging monocular the quality is decent. You can also record videos in addition to still images. The frame rate of the Scout TK is only 9 frames per second so tracking quick moving animals will be difficult however for an entry level thermal monocular most users will be satisfied. With the Scout TK, you can see objects in total darkness allowing you to be aware of your surroundings. The FLIR Scout TK has a identification range of 100 yards; meaning you can identify or recognize targets up to 100 yards away. It is pretty useful when you don’t want to get too close to an animal you’ve been tracking, or when using it for personal security at night. Explore even more as you get to see high-quality images on the FLIR Scout TK. Using FLIR’s proprietary Digital Detail Enhancement, this thermal camera is capable of producing decent pictures. You can detect and tell what’s on the screen, thanks to the 640x480 LCD display. Every image has details and great contrast to help you see the difference between your target and the background. The Scout TK is a great choice to take night hunting due to its small size, decent visuals and reasonable price. The FLIR Scout TK thermal imager uses four buttons to control the device. Pressing the power button will start the device in less than five seconds. From there, it’s just a matter of what you want to use the . It can capture images and even record video. A short press on the image-capture button takes brilliant pictures while a long press captures video. The device allows you to explore different color palettes from white to Black Hot, IstaAlert, Graded fire, Lava, Iron, Rainbow, and more. This gives you a broad preference of colors to help in modifying the image or video according to your liking. Even for a small device, it is surprising how much abuse it can handle. For one, the thermal camera has an IP67 waterproof rating. This means it is submersible to a depth of 1 meter for 30 minutes with no water damage. The device can handle rough terrain replete with dust and fog. It is entirely sealed against such elements ensuring that your image will always be clear. The FLIR Scout TK can also withstand a drop of 2 meters. The Scout operates in temperatures from -4° to 104° F. It can be stored in temperatures from -40° to 140°F, meaning it does not need any special care during storage. You’ll always want to consider the operating time of a thermal monocular before you put your money into it. The FLIR Scout TK uses a rechargeable Lithium-Ion Cell that provides up to five hours of operating time. This is enough time to for almost all outdoor enthusiasts. FLIR Scout TK also enjoys the 2-10 years warranty offered on all FLIR thermal imaging devices. The parts and craftsmanship are covered for two years while the detector is covered for ten years. You can tell it is a high-quality thermal camera seeing that the manufacturer can guarantee it for that long. Hunting - The FLIR Scout TK can be an indispensable aid for users venturing through the darkness. It helps to detect animals that easily camouflage themselves within the environment. This thermal camera does not need any light whatsoever to produce a clear image. You can spot an animal hiding in thick vegetation making it easy to identify. 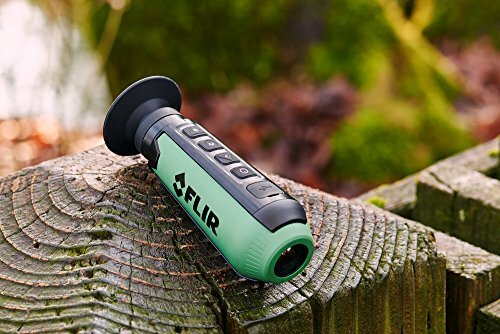 Outdoor Adventures - Apart from hunting, the FLIR Scout TK is a useful tool for backpacking, watching, wildlife, and exploring the outdoors. It is a compact, handheld thermal camera that can be part of your gear when in unfamiliar environments. It allows you to be aware of your surroundings so that you can follow the right hiking trail and always keep a safe distance from animals. The FLIR Ocean scout is a marine thermal handheld camera. It is rugged and weatherproofed to withstand marine elements like mist, fog, and water intrusion. This thermal camera is designed to help you see landmarks, vessels, floating debris, etc. so that you can navigate safely. If you are part of the coast guard or out on the water often at night this device will come in handy during as it can detect heat signatures of anyone or anything in the water. When compared to the FLIR Scout TK, the FLIR Ocean Scout TK is a different color, and it operates using three buttons. You can choose from three models regarding the resolution you’d like on the Ocean Scout. The sensor display options include; 240x180, 336x256, and 640x512 pixels. It has three color palettes for fast identification of animals or people in the water. FLIR Ocean Scout can detect man up to 1,150ft, 1,800ft, or 3,740ft. It can also detect a small boat up to 2,940ft, 5,085ft, or 9,842ft. It all depends on the model you choose to use. Ocean Scout weighs double the FLIR Scout TK at 12 ounces. It is an overall excellent thermal camera for marine use. FLIR Scout III is a compact thermal imaging camera. It is built more for night exploration, unlike the FLIR Scout TK which can do equally great during the day. Both of these cameras have parallel specifications which are reflected in their performances. The FLIR Scout III is in three models starting with a detector from 240x180 VOx Microbolometer to 336x256 to 640x512 VOx Microbolometer. FLIR Scout III can detect heat signatures of people and animals up to 550 yards away. Images are displayed on a 640x480 pixel LCD just like in the FLIR Scout TK. It provides crisp, clear pictures with better contrast than regular night vision devices that depend on ambient light. FLIR Scout III has a simple but a more advanced user menu. The four buttons can power the device, adjust brightness, zoom, and change the color palettes. FLIR Scout III has three color choices, unlike the FLIR Scout TK which has nine. The two devices are different to offer various usages in the ever-changing outdoor environment. There are many interesting things in life. The FLIR Scout TK opens our eyes to the infrared spectrum. It offers a rare experience that can only be seen with the help of a thermal imaging device. The FLIR Scout TK is an entry level thermal monocular but for the price it is a great purchase. The pocket-size monocular opens your world to curiosities you wouldn’t normally engage in. From hunting and backpacking to home security and utility inspection, the FLIR Scout TK is built to be used in many different applications. The FLIR Scout TK is a niche product and a worthy investment. If you are looking for an entry level thermal monocular or are on a tight budget you cannot go wrong with the Scout TK.